What happens when the “real” Pad Man meets the “reel” Pad Man? A special film like PAD MAN – the world’s first feature film on menstrual hygiene – is born and sparks a movement! Bollywood Megastar Akshay Kumar met humble superhero Arunachalam Muruganantham, a rural welder from India turned incredible innovator and inventor who certainly wasn’t wearing a cape when he was moved to provide women with access to high-quality and affordable sanitary pads 20 years ago, at IIT Bombay. Arunachalam’s story is the focus of the highly anticipated PAD MAN, releasing in cinemas on 26th January 2018. 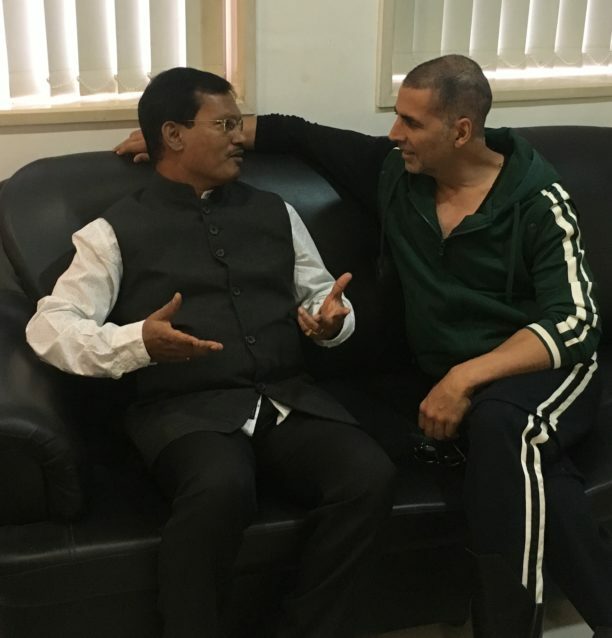 The real life Pad Man Arunachalam, one of TIME Magazine’s 100 most Influential Persons, will be played in the film by non-other than Akshay Kumar, who has become a symbol for social change through his efforts both on and off the big screen. The two met at the Mood Indigo event, the biggest youth festival in Asia, at IIT Bombay to interact with students and share the story and inspiration behind PAD MAN. 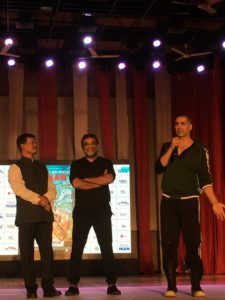 Arunachalam, writer and director of R Balki and lead star Akshay Kumar delivered charismatic speeches to an audience replete with members of generations to come, who are seen as vital cogs in the wheel of the social renovation behind this film. The event epitomised the youth appeal of the movie, and the fundamental need to educate those who will form the core of future societies. Bringing the real life Pad Man face-to-face with the youth of today to celebrate and embrace his innovations and inventions will no doubt act as a substantial inspiration at one of the biggest hubs of engineering, IIT Bombay. Akshay Kumar entered the stage to a thunderous applause from the students. He said, “Today you are seeing two heroes – the reel hero and the real hero. Arunachalam is the real hero who did something extraordinary that is so important for our country. As you may know 82% of women in our country do not have access to sanitary pads. Some don’t have the money to afford them and end up using things such as leaves, rag cloths or even ash in place of sanitary products. Some women don’t even have awareness of sanitary products. Their event comes following the rapturous reception of the film’s trailer, which has become the highest viewed Bollywood trailer on Facebook after receiving over 19 million views in addition to over 31 million views on YouTube. Watch real Pad Man Arunachalam meet the reel Pad Man Akshay Kumar here. 15 queries in 0.484 seconds.